Sponson tubes. 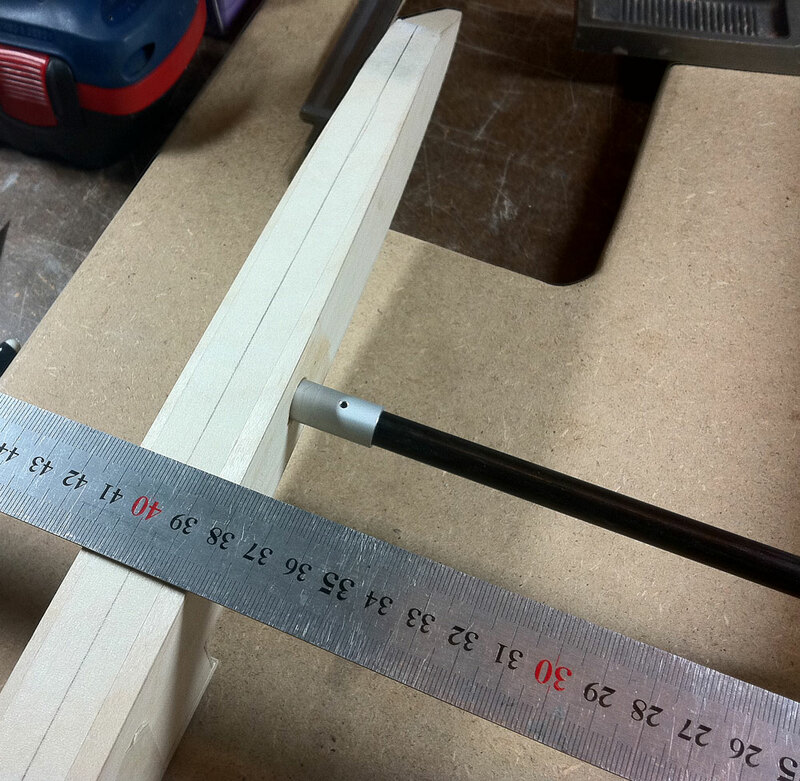 Important to get them level and straight. 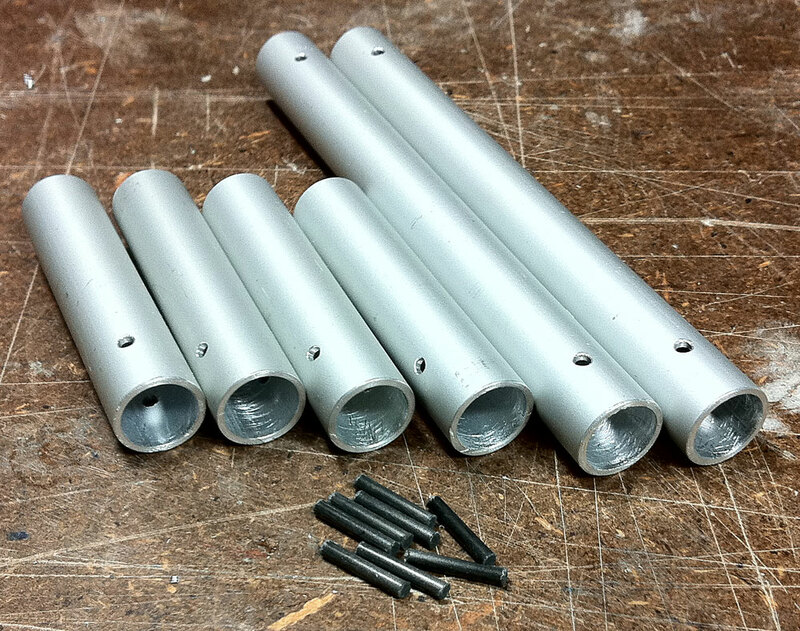 We use 10x8 mm pultruded carbon tubes and these 12x10 mm aluminum tubes that slides perfectly on them... 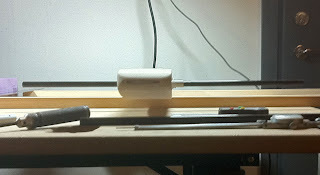 The aluminum tubes are epoxy glued in the tub and sponsons. 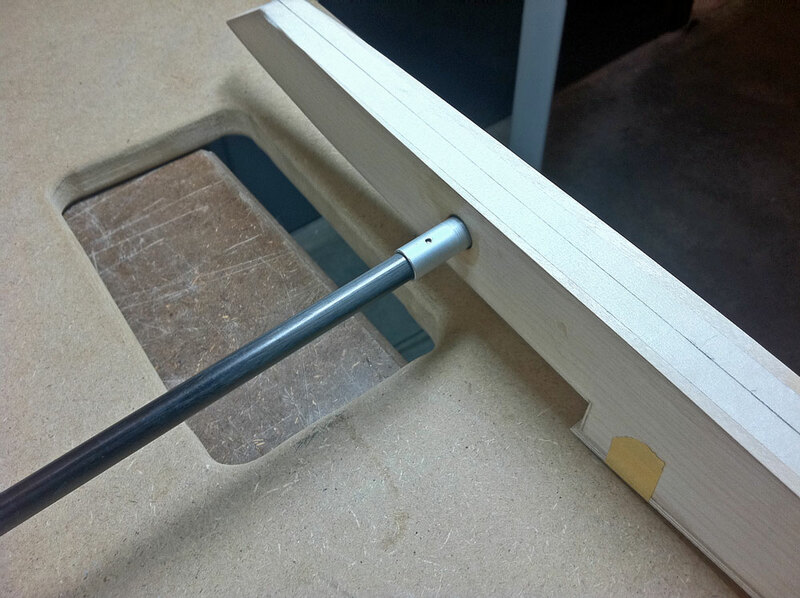 Carefully drill a 2 mm hole in the center of each tube 10 mm from the edge. That hole is aligned vertically when glued in place. I cut the length of my personal carbon tubes to 470 mm. The small pins are made of 2 mm solid carbon rods. They are used as locking pins for the sponson tubes. 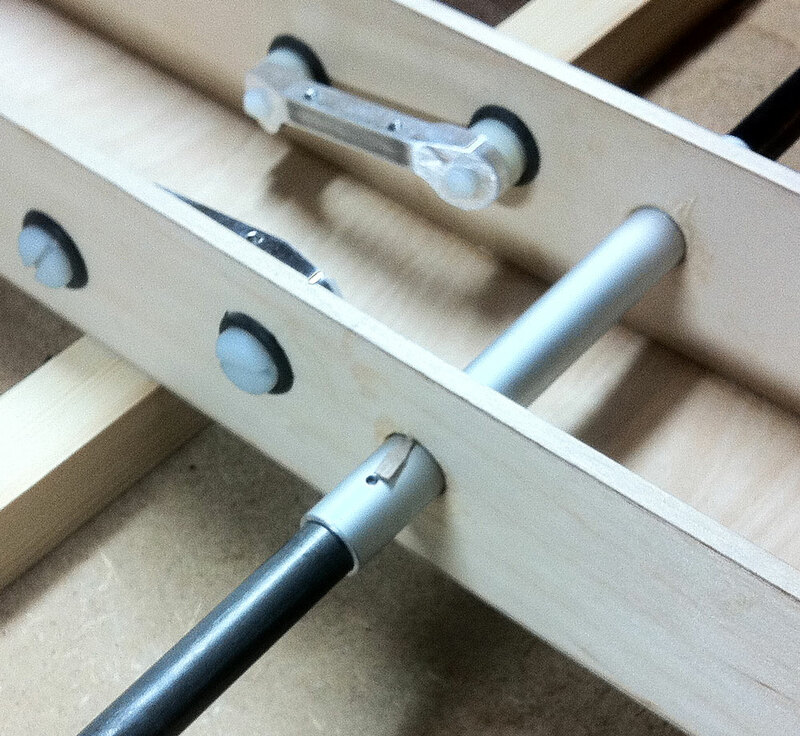 It creates a very rigid mount! Note, in 2011 and 2012 we used nothing else then electrical tape to lock the tubes in place... These added pins make's it very solid! I use my set-up board as a flat surface and use two 25 mm high wood blocks for the tub to rest on. Make sure that the holes in the tub is a tiny bit too big. Or at least the aluminum tube should not fit snugly... 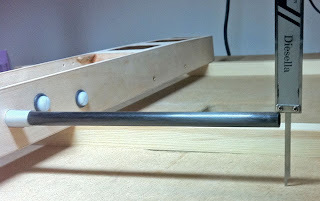 Attach the rear most aluminum tube in the tub and slide in the sponson tube. 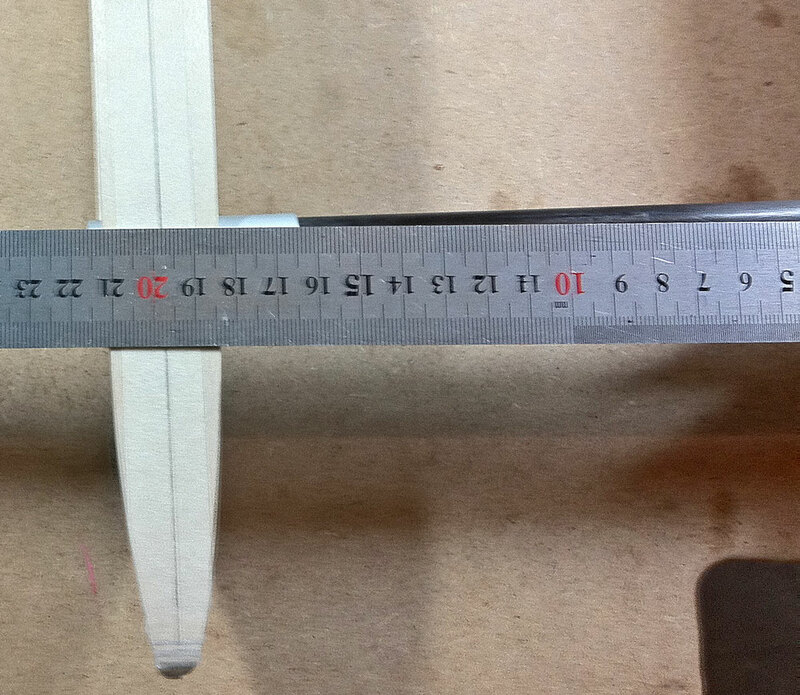 Check each side to be level with the set-up board = same height left and right. The left and right side is very seldom perfect right from the start. You usually need to open up the holes a tiny bit to tweak them. 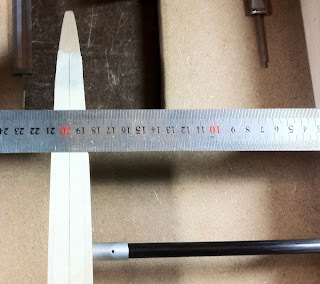 For that reason you can use small glue wedges that is inserted to hold the tube at that angle. 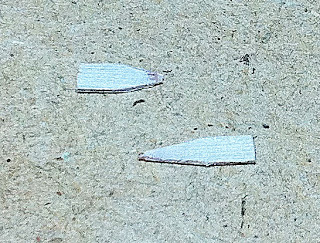 In this case its 0.4 mm thin plywood pieces that has been cut out and sanded to fit. Make sure to dry-fit them like this so you know how to insert them when actually gluing the tubes. Remove the tubes and sand the areas to be glued. Use 30 minute epoxy and glue one aluminum tube at a time. Dip the wedges in glue before inserting them. 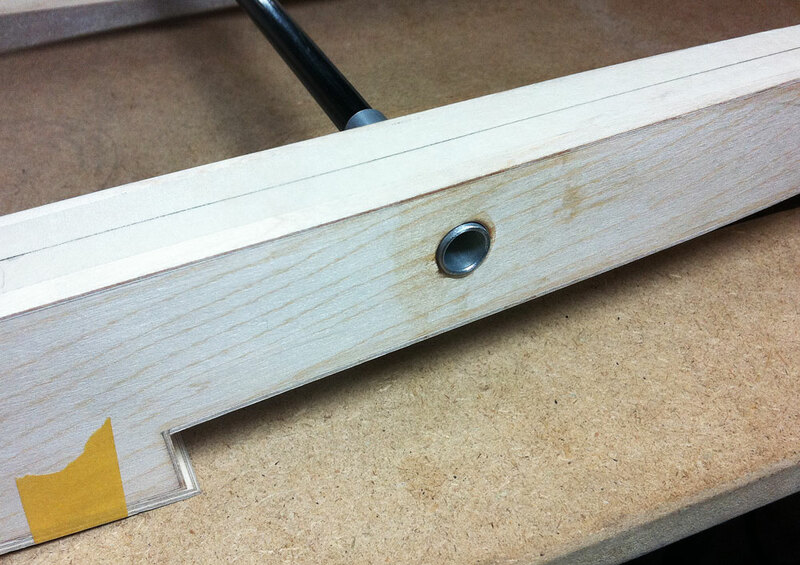 Make sure the 2 mm holes are aligned vertically and that the tube protrudes equally on each side of the tub. Double check everything at least twice before leaving it to set. 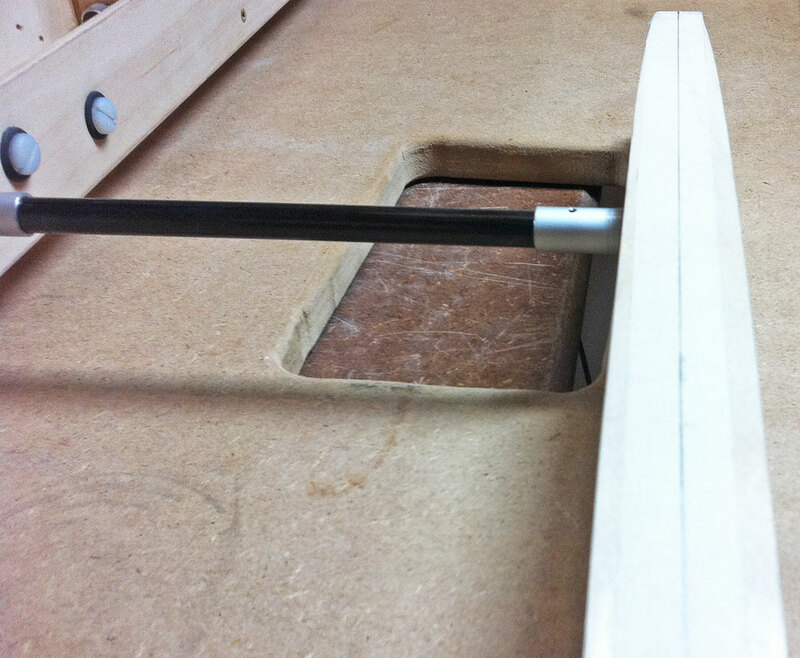 Don't worry about the small plywood wedge sticking out like this while the epoxy sets. They will be cut away afterwards with a hobby knife. When the 30 minute epoxy has set. Repeat the process on the second tub-tube. The process is repeated for the sponsons at one side at a time. If you are uncertain you could do one tube at a time here also. Put a strip of masking tape on the top of each sponson and mark out the centerline with a pen. Dry-fit everything so you know that you can align the sponsons to be centered completely and no toe-in or out. Most of the time the holes on the sponsons need to be opened up slightly so they point perfectly straight forward. They also need to be resting perfectly flat on top of the set-up board. Tape the ride-pads on the bottom of the sponsons for now. 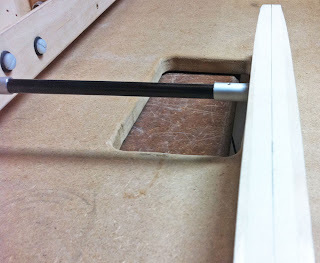 Use only one tub-spacer at the rear for the tub to rest on - in the front the boat should rest on the sponson ride pads. 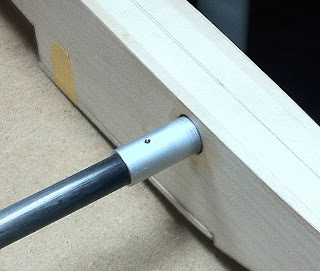 You should do the appropriate sanding of the holes in booth sponsons at this time. 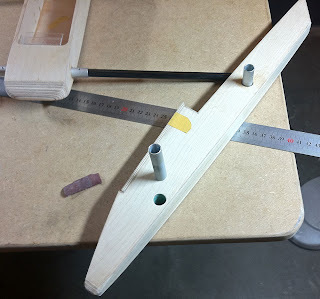 You will glue one side at a time but the other side's sponson should be attached also for alignment purpose. Sand all tubes to be glued and mix some 30 minute epoxy. Spread 30-minute epoxy inside the sponson holes and also on the outside of the aluminum tubes. 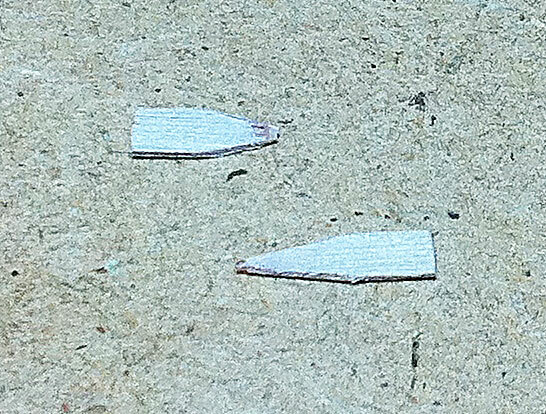 Carefully push them in the sponson and twist them around to spread the glue. Align it so the 2 mm hole is vertical. If epoxy has entered on the outside part of the aluminum tube you can remove it with some paper towels. The sponson width itself is not important at this point. Align the sponson so the centerline of it is in perfect parallel to the tub. Use a ruler to check front and back. Double check that the boat is resting on the perfectly flat ride pads. 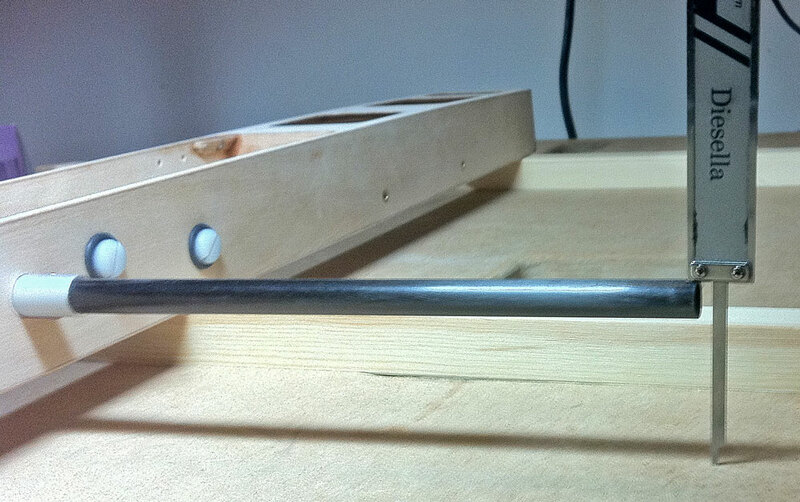 The aluminum tube should protrude slightly on the outside - that will be sanded smooth later on. 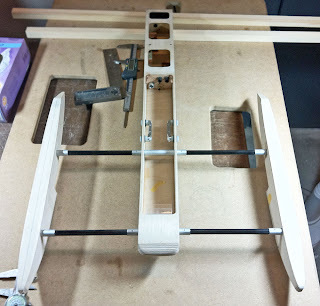 Repeat the process on the other side and you're done with the major sponson tube gluing!